In recent years, the demand for outstanding protection for a wide range of properties and installations has grown dramatically. Criminal activities and even terrorism are constant concerns. For commercial and government organizations, new requirements demand that perimeter enclosures be more secure than ever before. In many situations, existing barriers are no longer adequate and need replacement. Chain link fencing is still one of the most secure methods of protecting properties from most threats. In other cases, specialty fencing is required, however, to meet specific regulations and rules. For either need, we can supply you with top-rated products from U.S. manufacturers. Where chain link materials are used, only specifically designed products are adequate. As a leader in fencing and access control, we can assist you with product selection and can supply you with materials and parts that meet any requirements and applicable regulations. Our products designed to protect highly sensitive areas, such as those listed below, are available at outstanding low prices. We ship directly to you from the manufacturers, so you also save on warehousing and shipping costs. The needs of law enforcement organizations, jails, prisons and other correctional facilities are specialized. 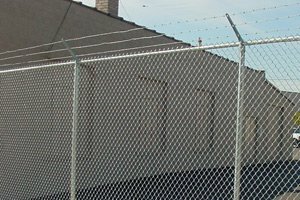 High chain link fencing is often used at these facilities for perimeter protection against escapes and entry from outside. Even inside such facilities specialized enclosures are often required. Specific features such as barbed wire and barbed tape are often added. We can supply materials for these facilities that meet any requirement required. Contact us with your specifications and let us assist you with complete orders at excellent discount pricing, shipped directly from the manufacturers. The terrorism threat profile for electric power utility and natural gas utility facilities, as well as water utilities, is growing. New regulations from the Department of Homeland Security mean that these companies must upgrade perimeter protection around transformer and distribution substations and other, often remote, substations and installations. High-security chain link fencing that meets the latest requirements is still a viable way to meet those needs. Contact us for assistance in supplying top-quality products for your upgraded designs and new installations. From perimeter fencing to highly secured areas within these installations, chain link fencing is widely used to protect property and to guard specific areas from unauthorized access. We can supply all installation materials, gates and other accessories to meet any specifications for these needs, both outside and inside of your facility. Our expertise and access to manufacturers lets us assemble complete, customized materials lists for direct shipment, at discounted prices. Contact us at any time for assistance. All data processing and data storage facilities are facing increasing threats from hacking, data theft and other potential damage. The costs of staffing facilities with adequate personnel can be reduced through effective perimeter protection. These facilities often need fences that are like those used for correctional facilities, and that incorporate intrusion detection systems and extensive video camera monitoring. We can assist organizations with these requirements by supplying both high security fencing products. Facilities that manufacture, distribute or store hazardous, explosive, toxic and otherwise dangerous chemicals are potentially vulnerable to terrorist attacks. Because of those risks, perimeter protection is needed to guard such properties. Chain link fencing, with accessories like barbed wire fence tops and other entry deterrent technology are often used for this purpose. At our direct-shipping, discount supplies store, we can supply and ship a complete range of products, materials and accessories designed to meet any specifications. Natural gas and petroleum pipelines all require pump and compressor stations to keep products flowing. These stations are generally located at remote sites, and are often unattended. They are increasingly a target of terrorism and vandalism. High security chain link fences help to protect these important installations. Visual deterrence, using inserted visual barrier strips, is often added to lower visibility as well. We assist you by supplying and shipping all materials for these installation directly from manufacturers at discounted, highly competitive pricing. Our company is the nationwide, direct-shipping supplier of choice for a full range of high security enclosure and access control products. Whether you need maximum security chain link materials, steel perimeter grid walls from Ameristar, turnstiles, gate operators or various gates, we are your one-stop source. Our experts are always available to consult with you and to prepare complete, comprehensive materials lists from your designs. We will arrange for and expedite fast direct shipments from the manufacturers to your location. Through our high-volume purchasing and direct shipping, we help you save by eliminating warehousing costs and low, factory-direct pricing. Contact us today to discuss your perimeter protection project.